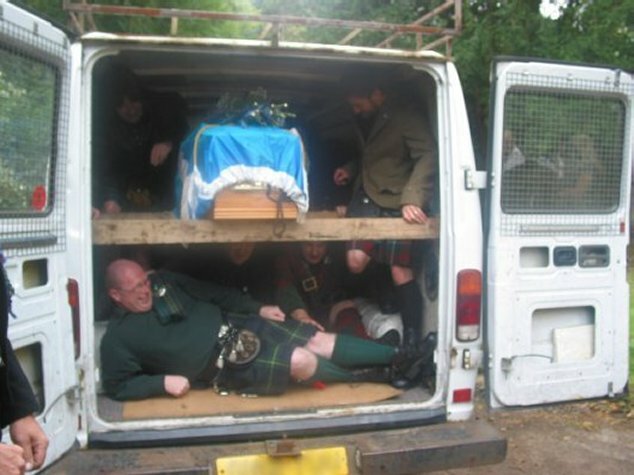 The day started with the collection of the coffin from the private chapel in Lee Castle, where it had lain overnight. 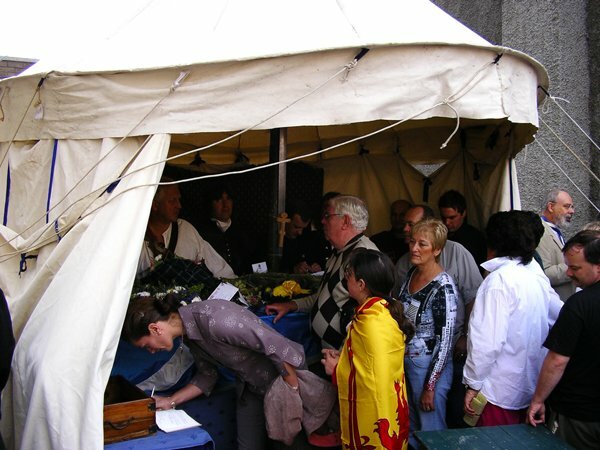 A small private service was held, officiated by Celtic Bishop David Stalker. 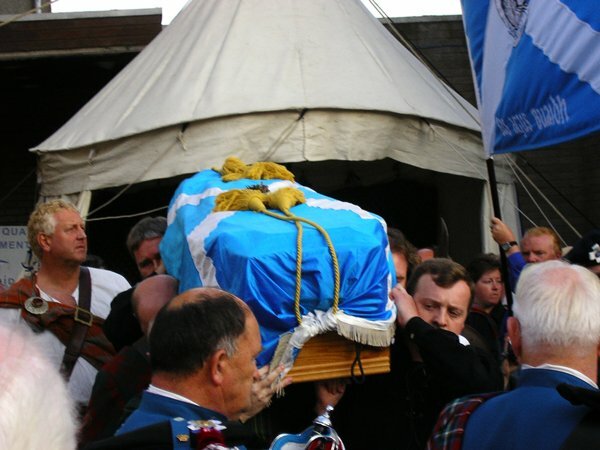 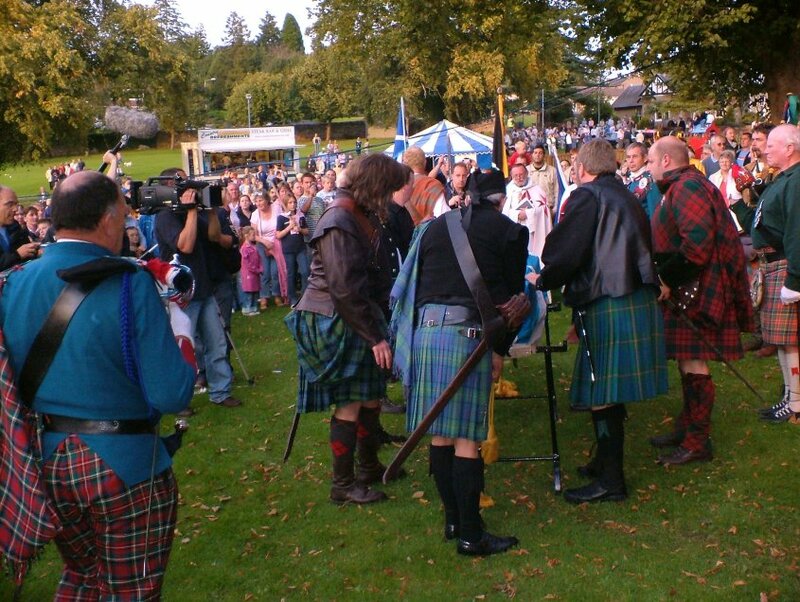 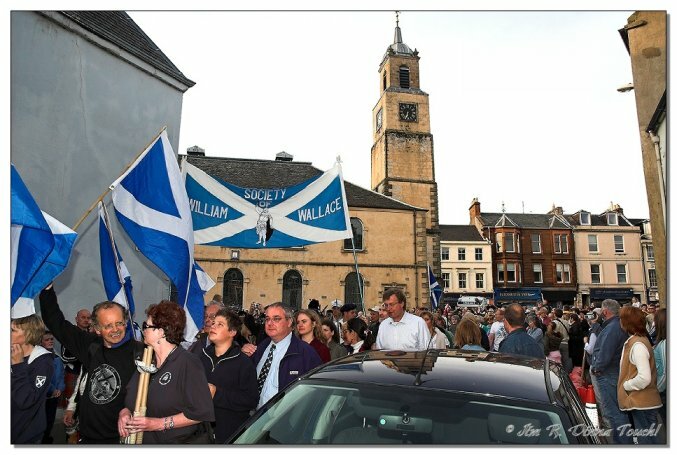 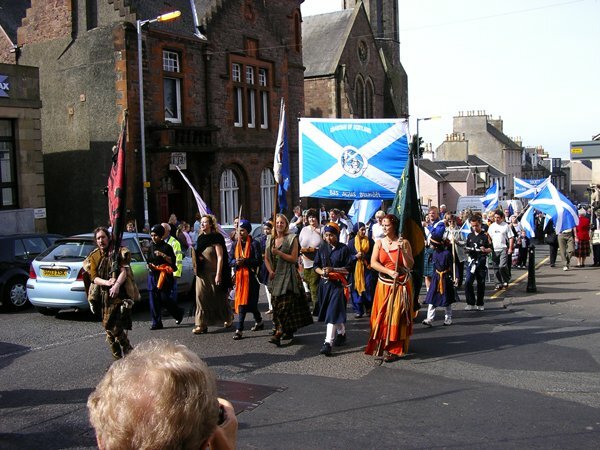 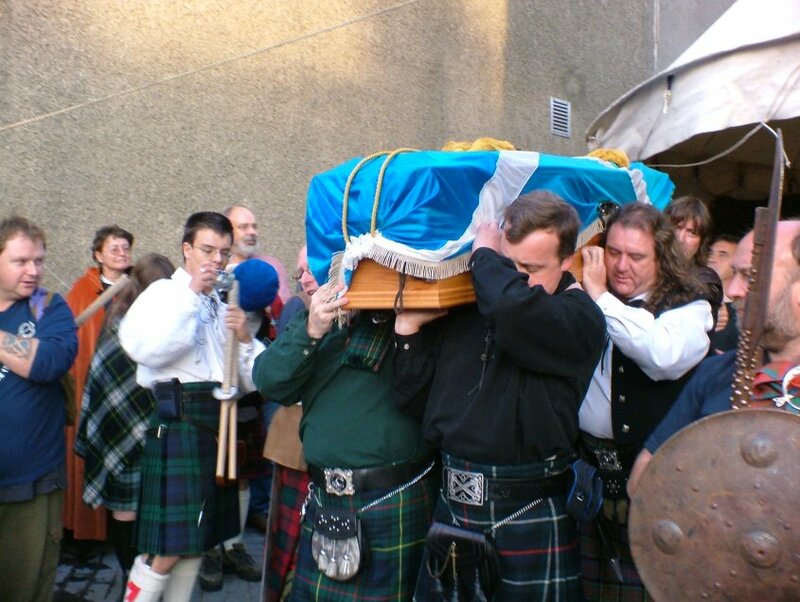 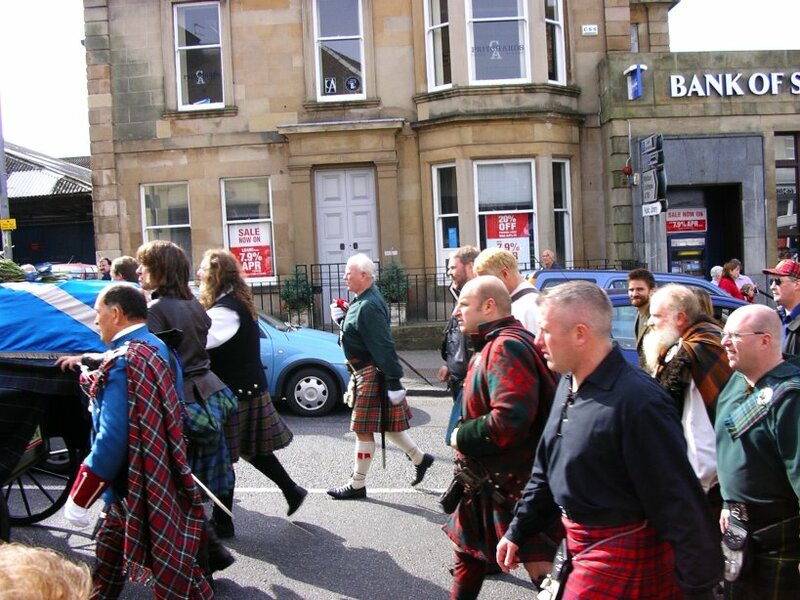 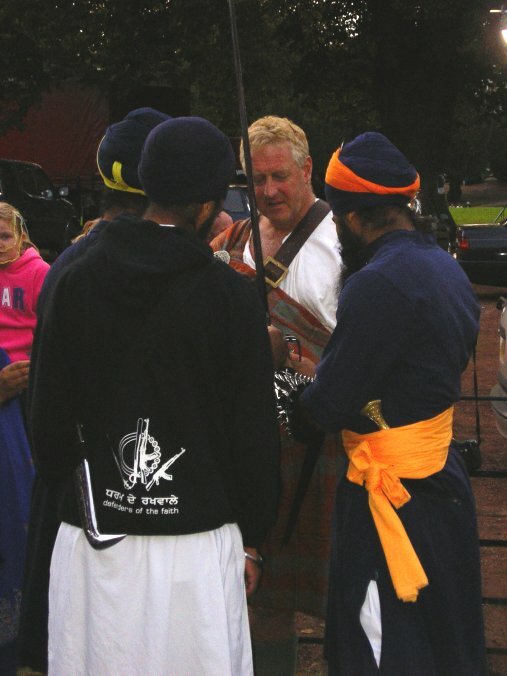 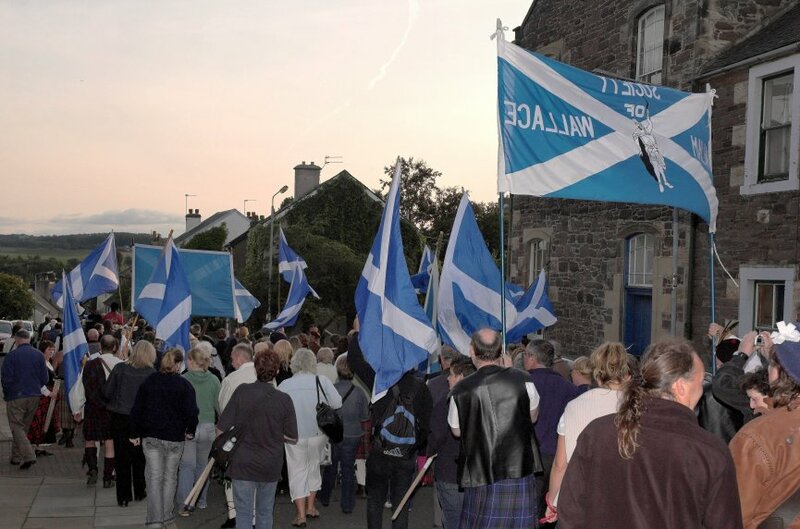 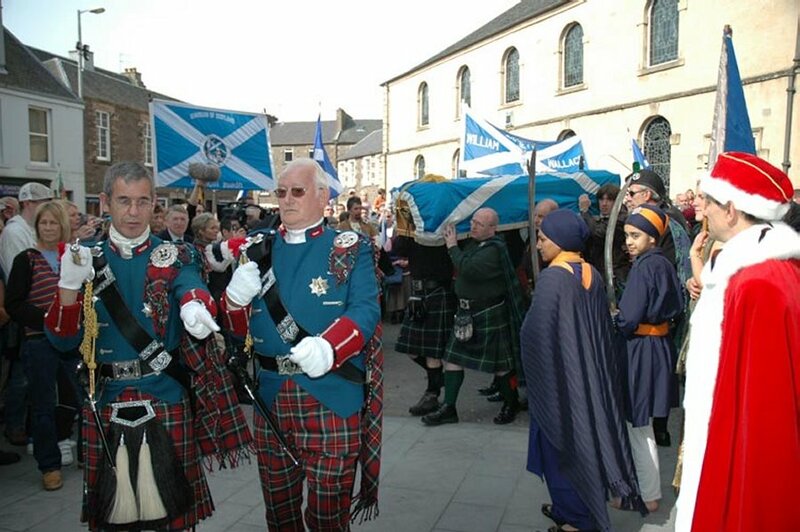 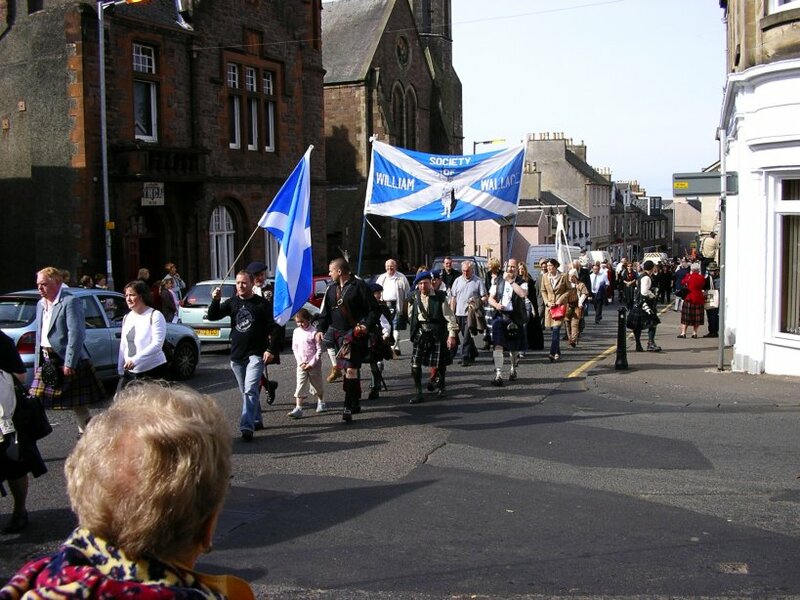 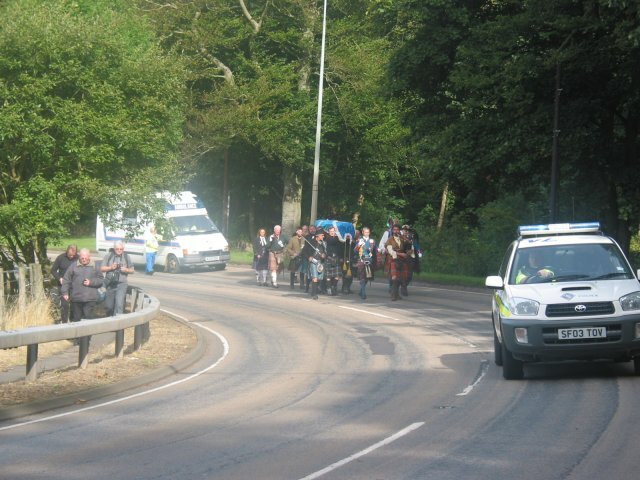 The coffin was then carried the mile from South Lodge to the Cartland Bridge Hotel, where the rest of the march was waiting - pipe band, the Society of William Wallace, a contingent of Sikhs and various others. 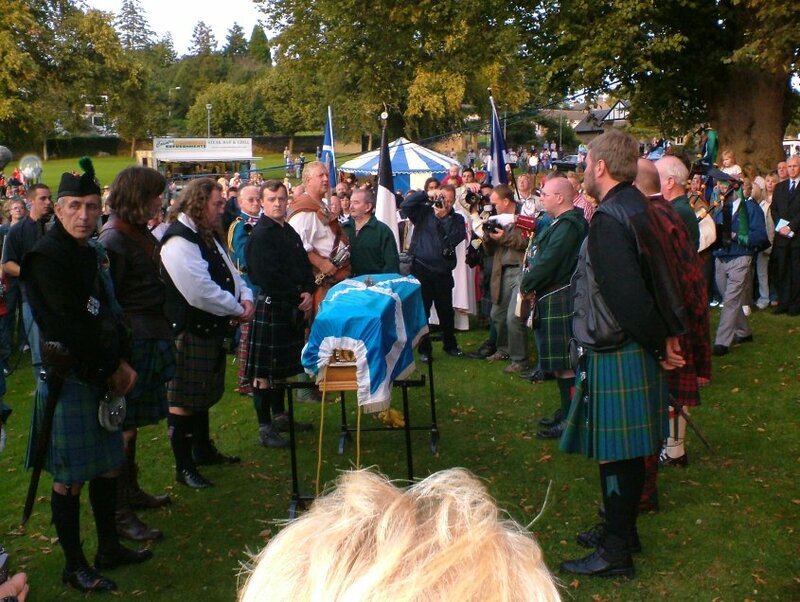 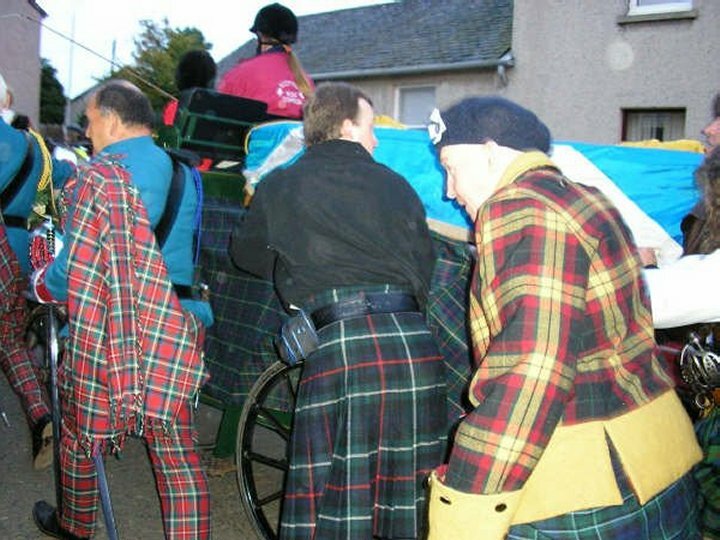 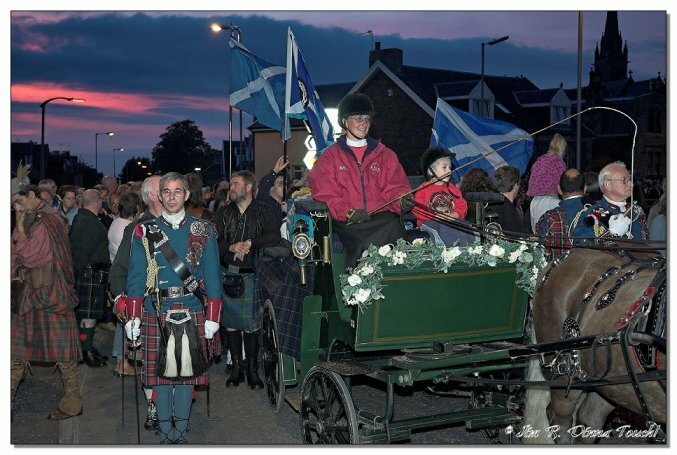 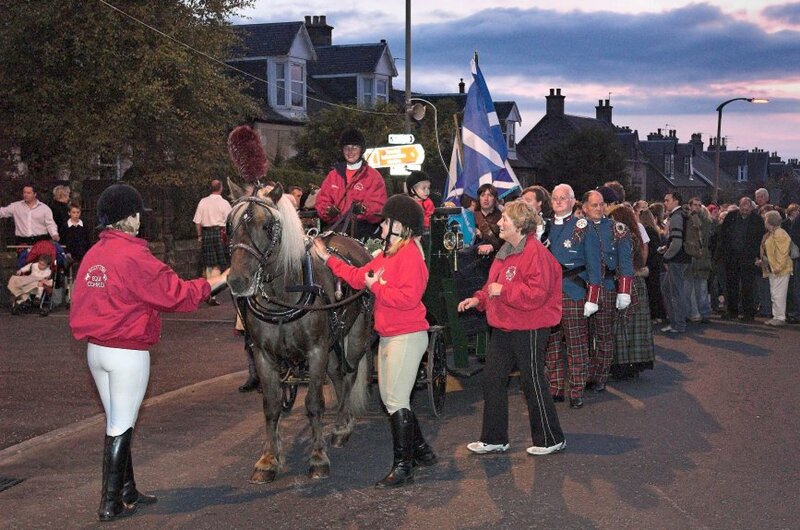 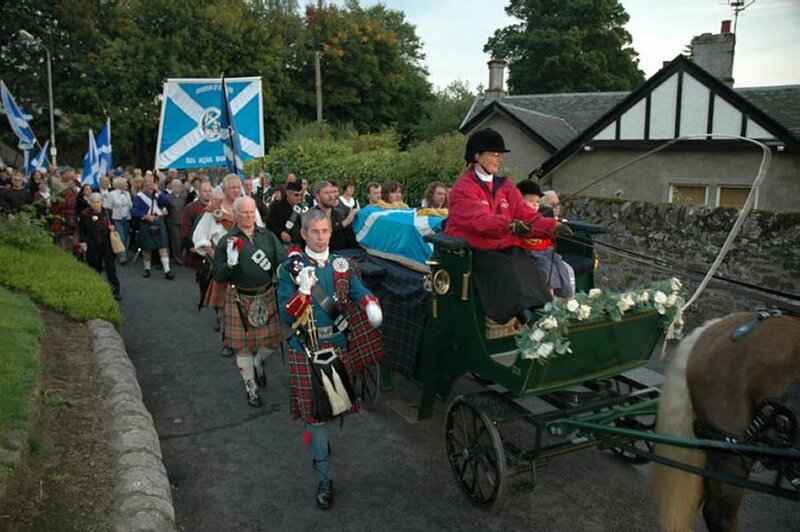 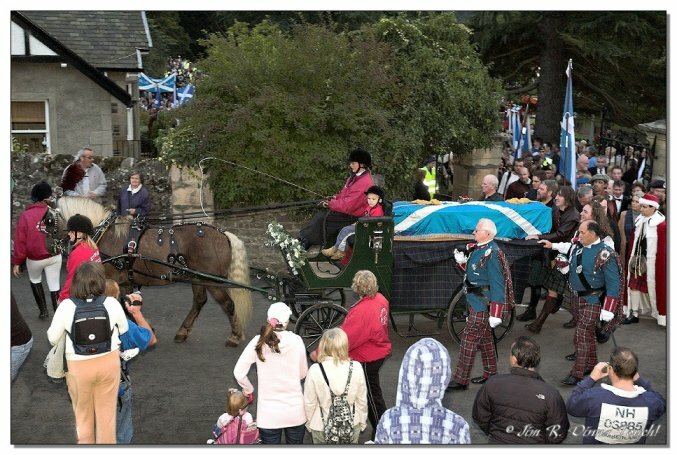 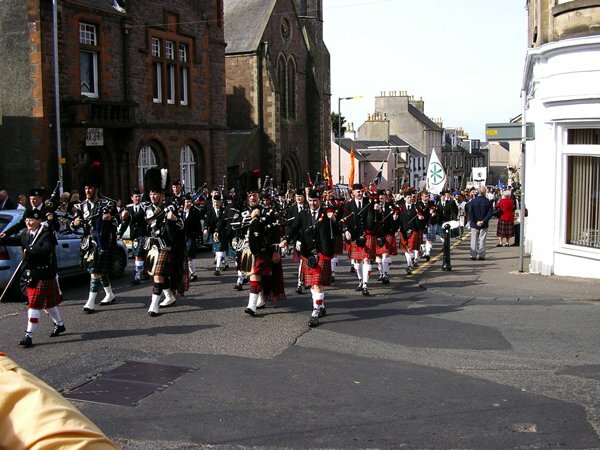 The coffin was placed on a horse-drawn cortege and followed the parade up the hill into Lanark, when the coffin was placed in a tent erected on the site of Marion Braidfute's dwelling. 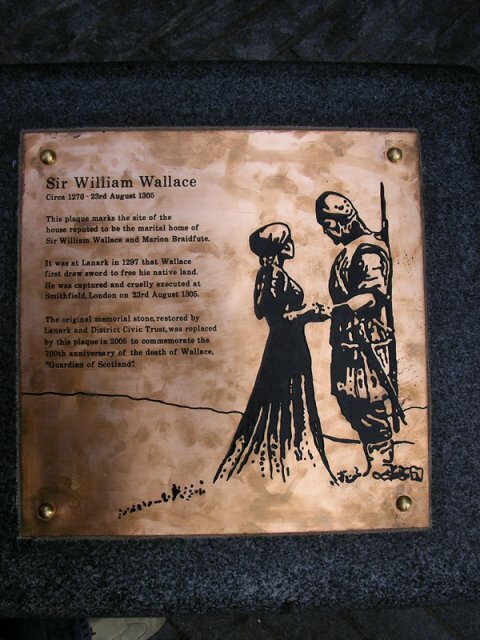 A new plaque was unveiled, and then a visitor's book was made available to those who wished to sign it or leave a tribute. 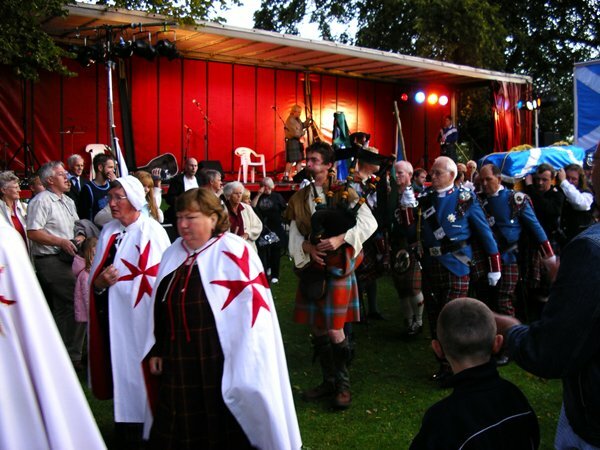 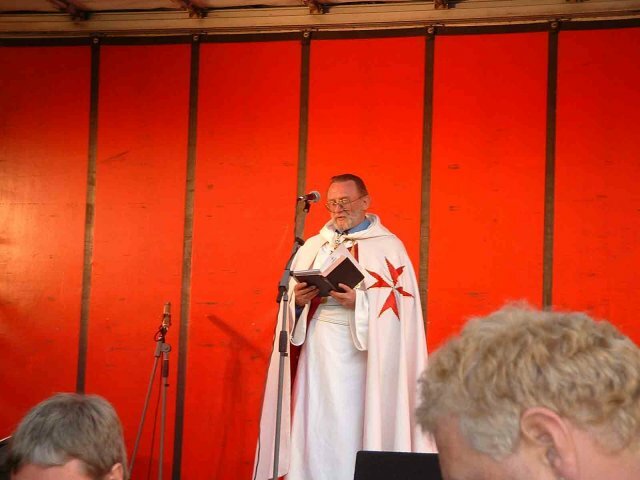 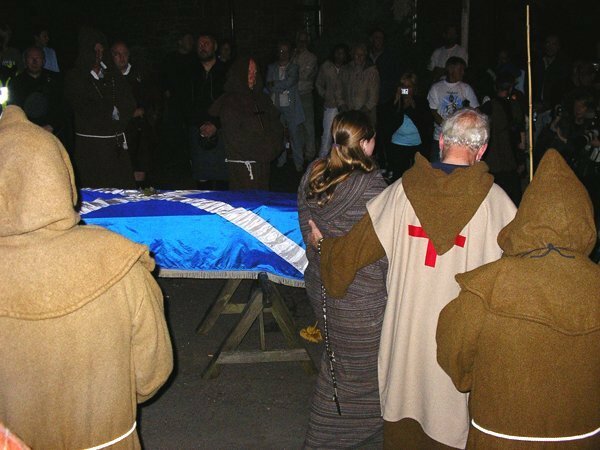 At 6:30 in the evening, the coffin was placed back on the cortege and taken down to the park for a battlefield blessing, conducted by Ken Shirra of the Knights Templar. 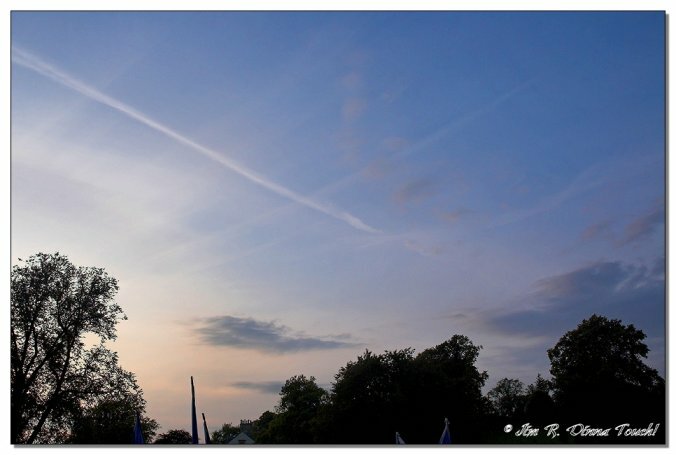 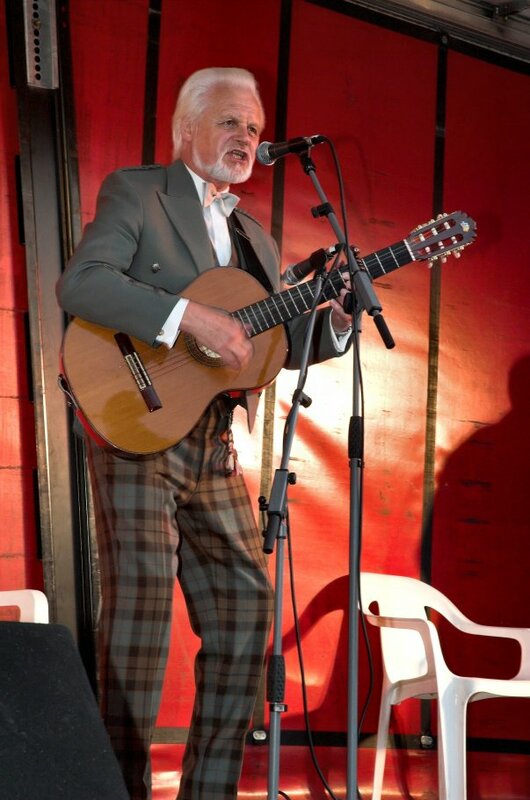 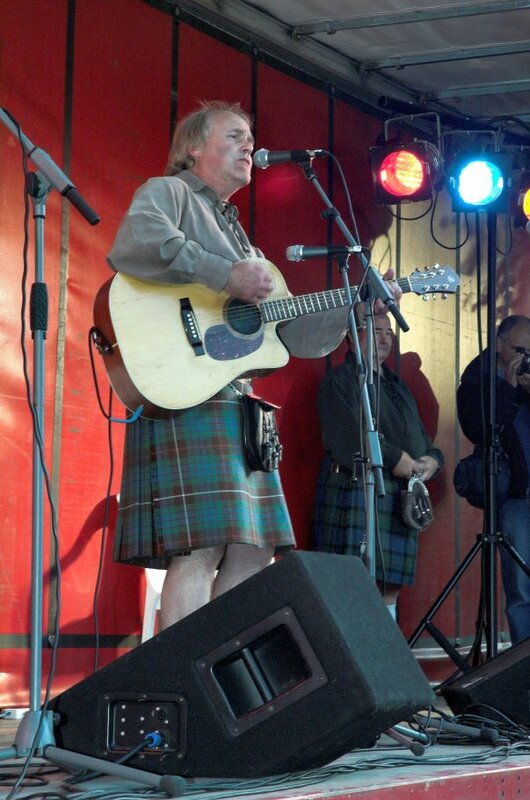 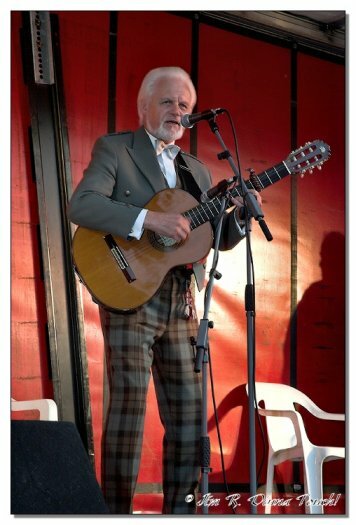 Ronnie Browne sang "Flower of Scotland", and a saltire cloud appeared in the sky. 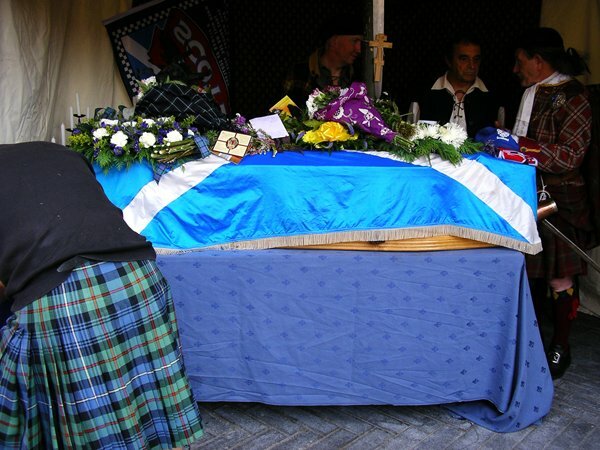 Ted Christopher sang "I'm Coming Home", and the coffin was then carried back to the cortege for the final journey. 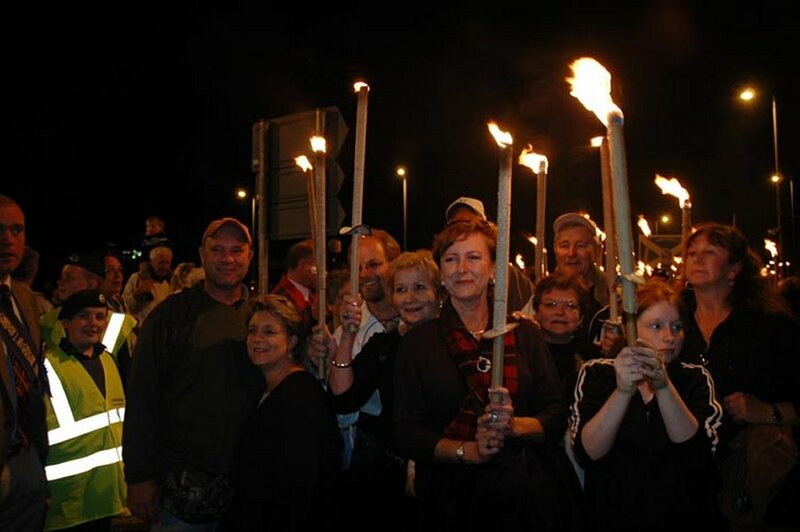 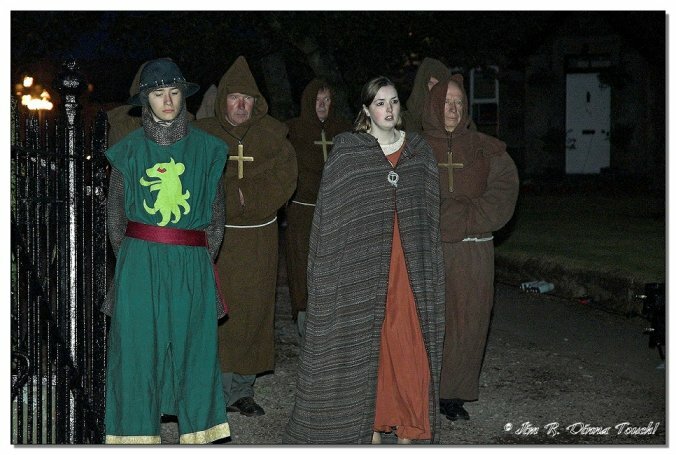 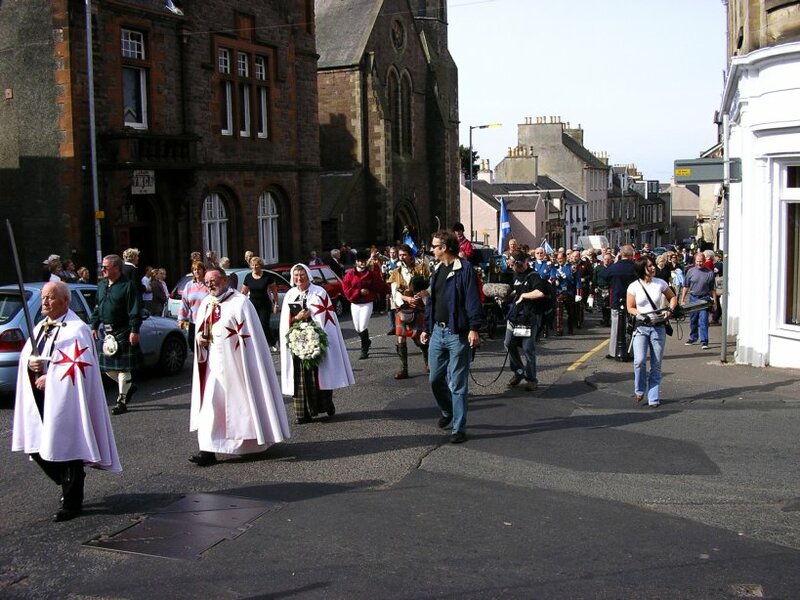 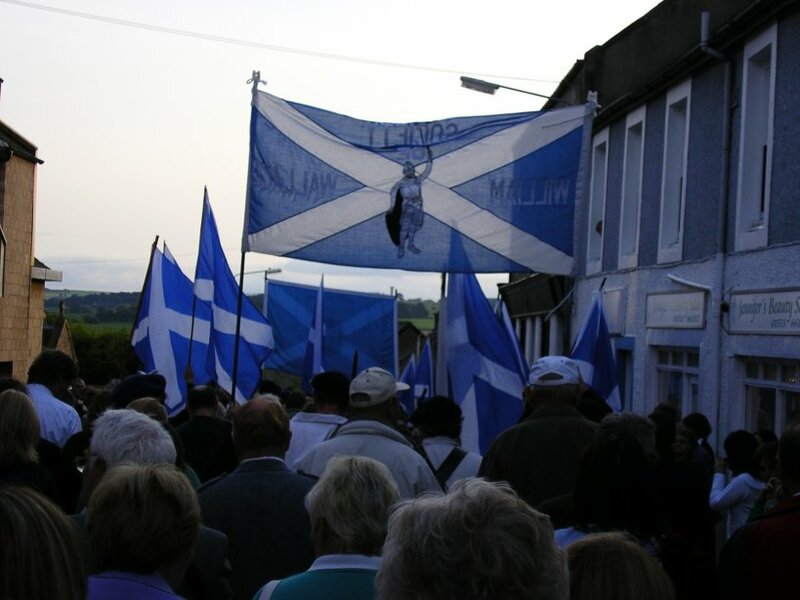 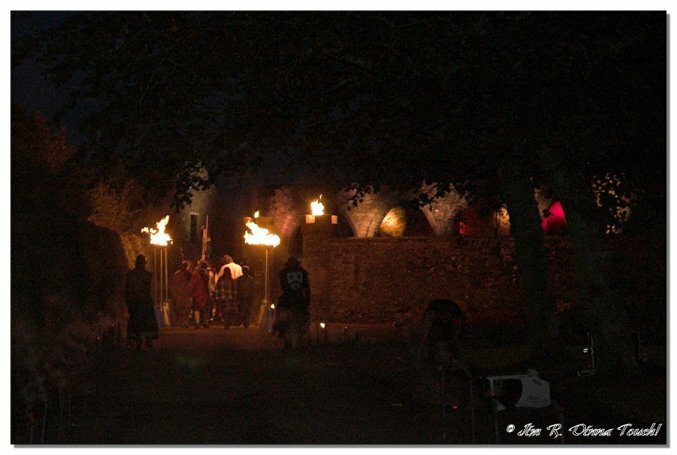 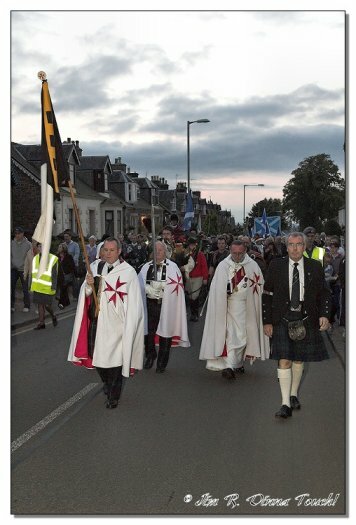 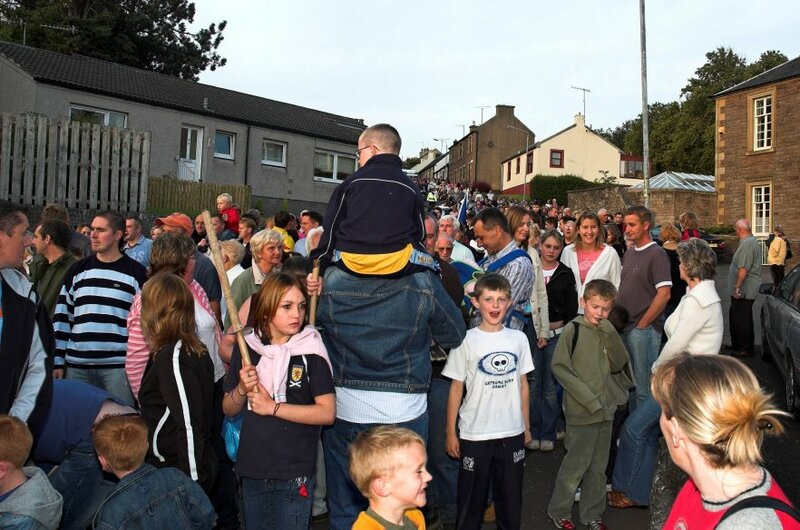 Back up the hill, through Lanark and out toward old St Kentigern's kirk the procession wound, as the light faded. 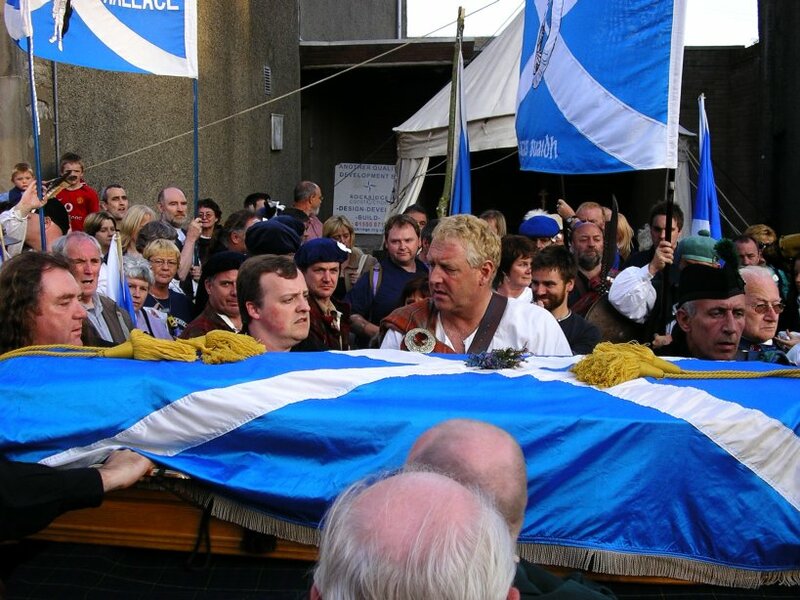 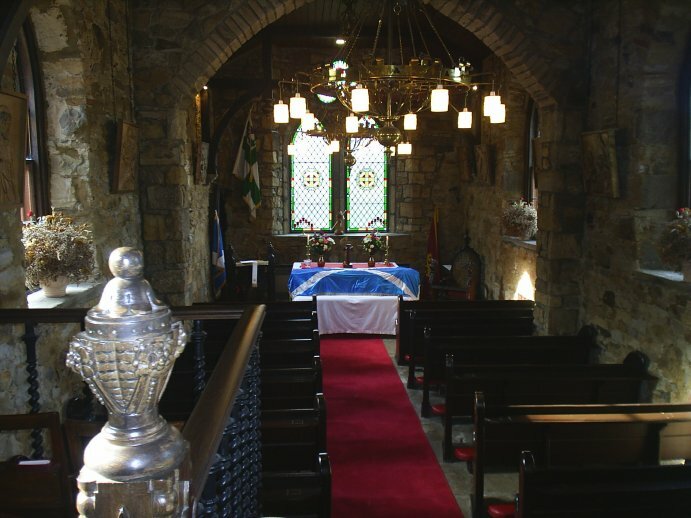 On arrival at St Kentigern's, David made a speech and the coffin was lifted from the cortege and placed on trestles. 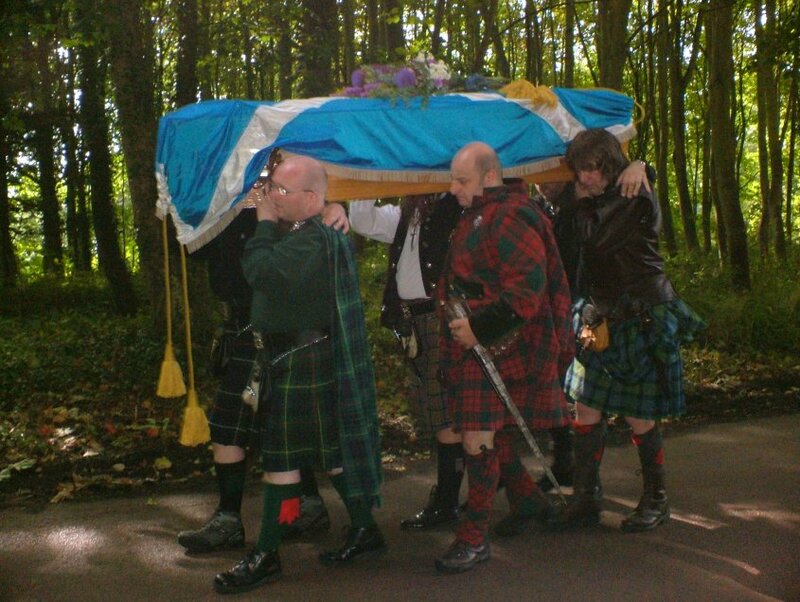 "Marion Braidfute", "John Blair", and some monks appeared from within the kirkyard grounds, and gathered round the coffin. 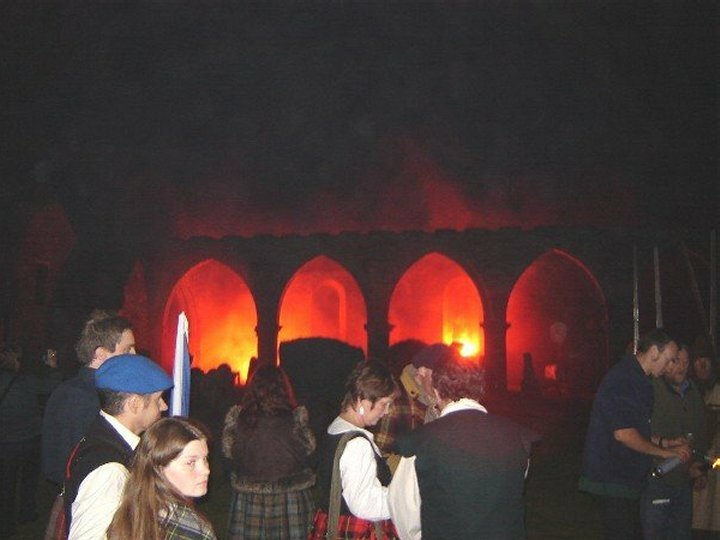 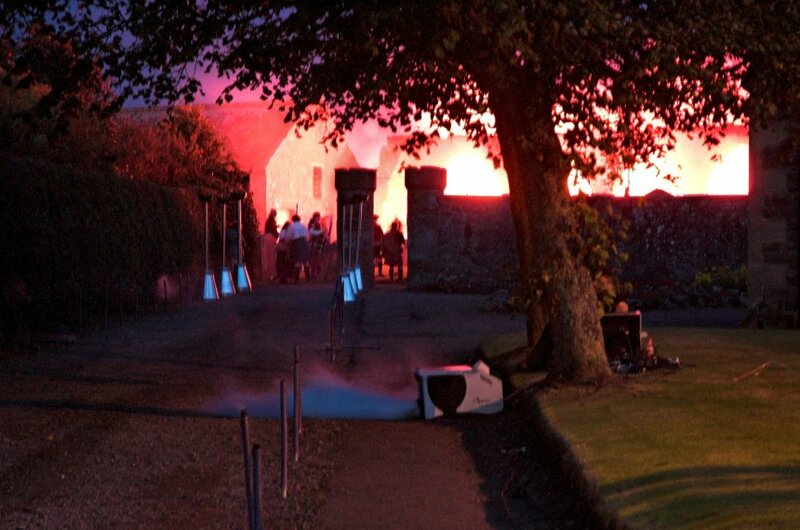 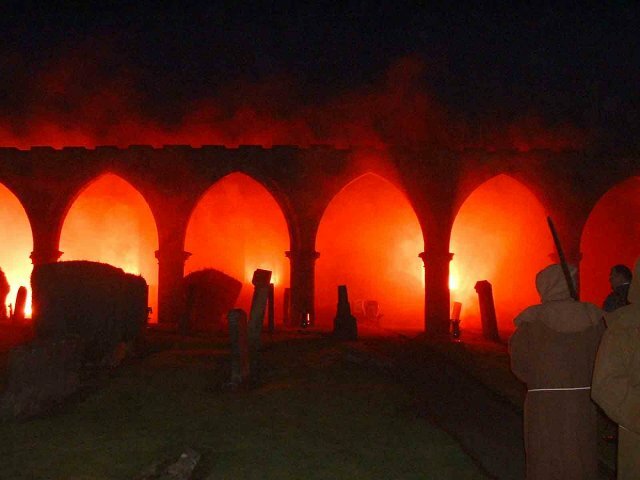 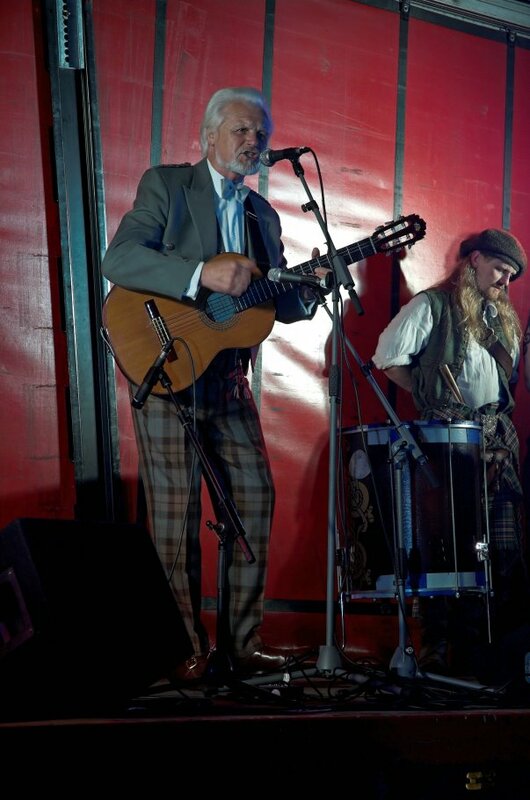 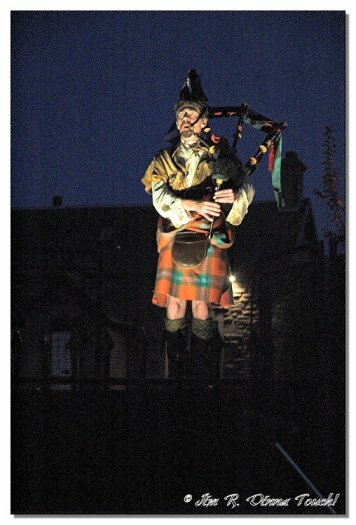 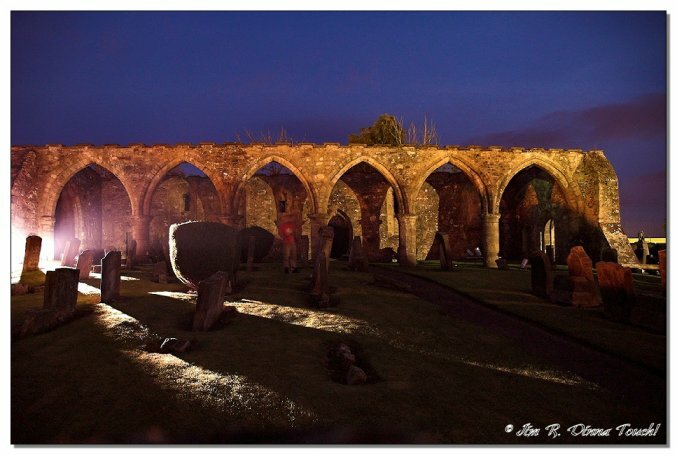 As a lone piper played, the coffin was lifted and carried into the mists, while the kirkyard was illuminated by a crimson glow. 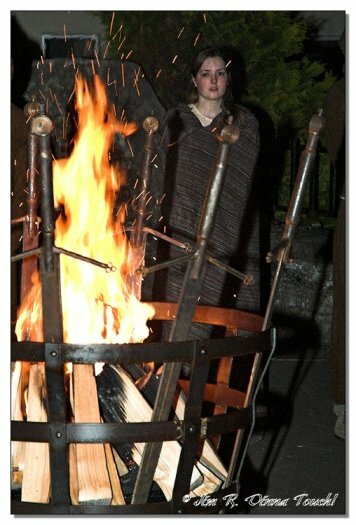 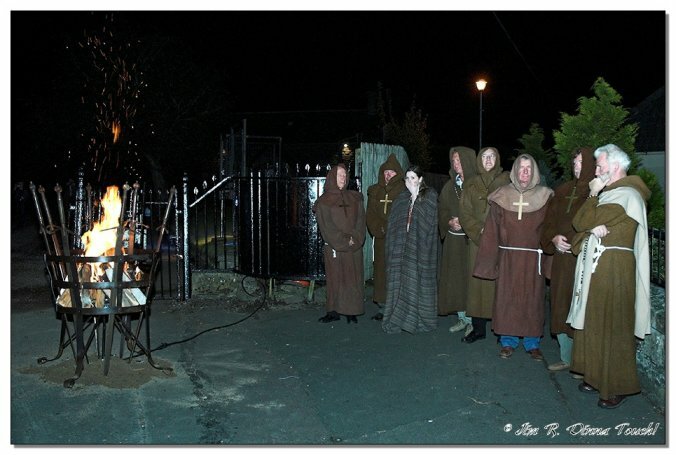 The monks reappeared with Marion and John, and the brazier was lit. 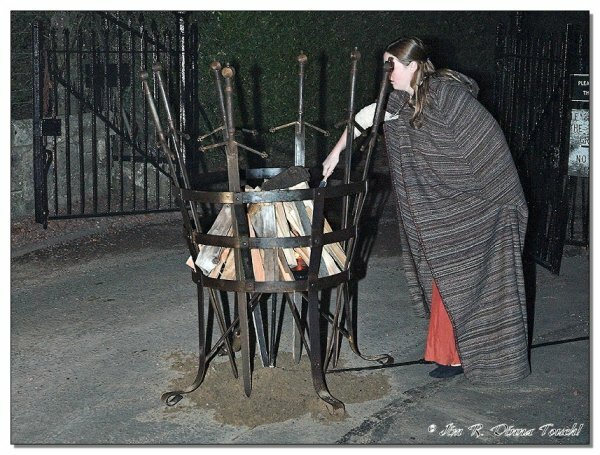 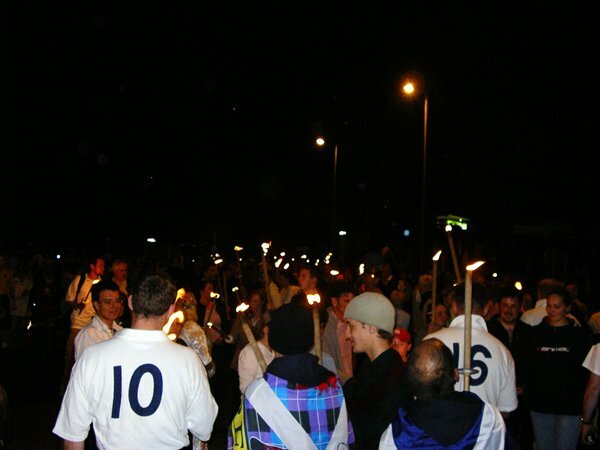 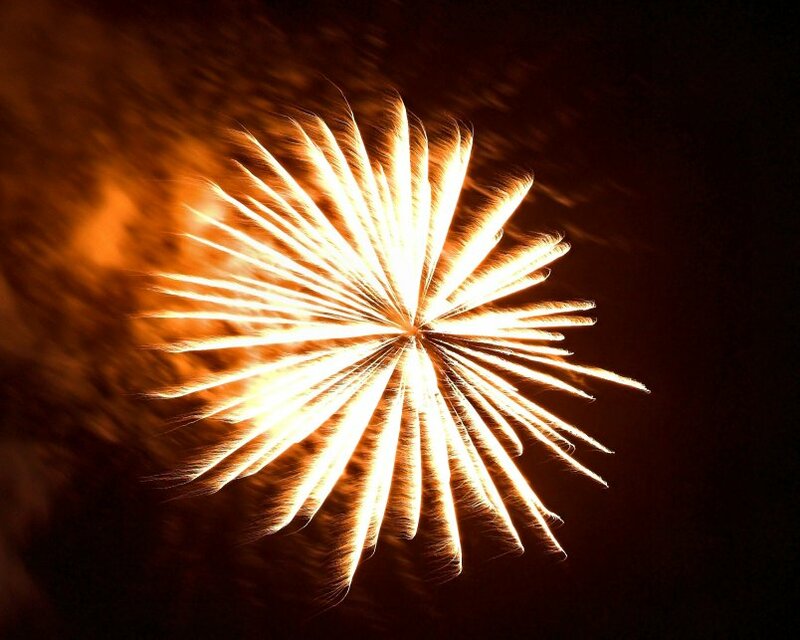 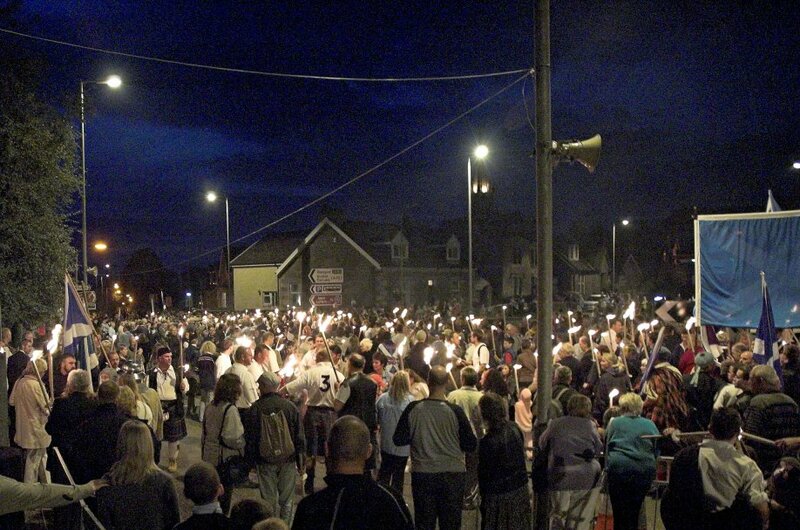 This was then used to light the 700 torches issued for a torchlit procession back down to the park, where Ronnie Browne and others entertained the crowds following a spectacular firework display. 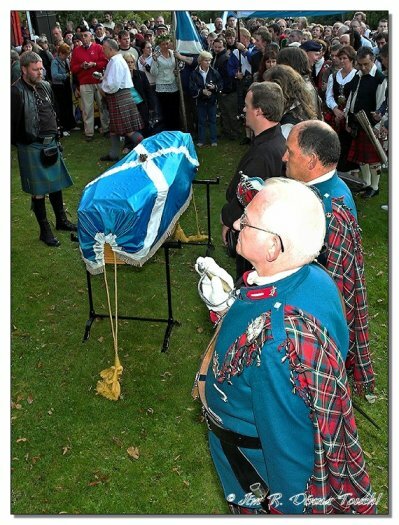 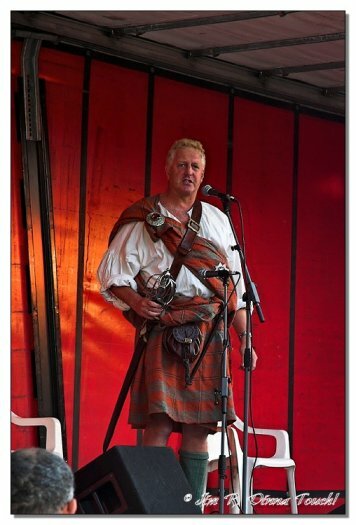 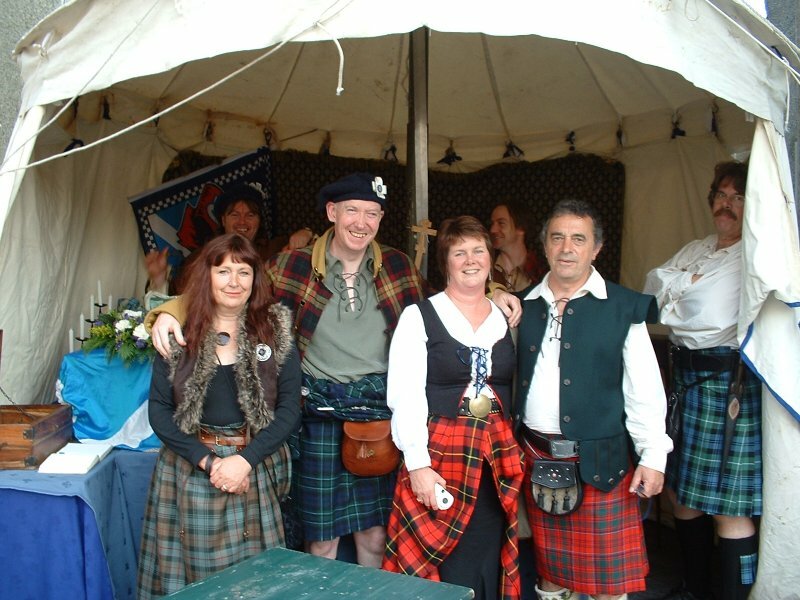 Sir William Wallace's Spirit had come home.